Quite close to St Ignatius’s childhood home in Loyola is a shrine to Our Lady of Olatz. He is believed to have visited this shrine as a boy, and again on his way out of town following his conversion. 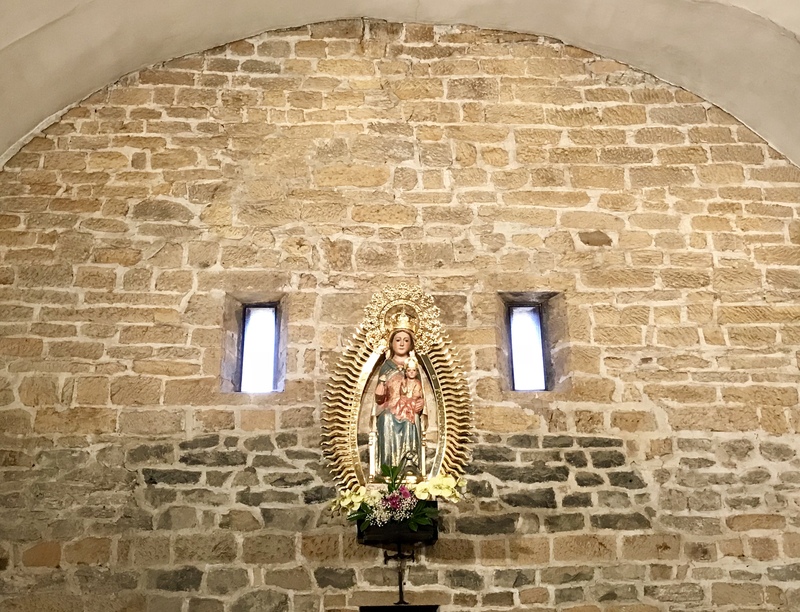 We too visited Our Lady of Olatz on our way out of Loyola on pilgrimage, learning just before we entered for mass that Ignatius prayed the Salve Regina in that same chapel. Our group, with more than a few musical pilgrims, sang the Salve Regina after communion. 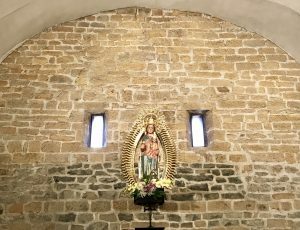 The small stone chapel seemed made for singing, with perfect reverberation that made our few voices sound like the whole world greeting the Blessed Virgin. St. Ignatius had a deep devotion to Mary. He made vows to her, laid his sword before her at Montserrat, and longed to defend her honor. It’s easy to see how his chivalric values were applied to his devotion to Mary. I can analyze it with academic detachment, but it doesn’t resonate much with me at all. Together we visited shrine after shrine – some off-the-beaten-path like Olatz and Aranzazu, and some wildly popular like Montserrat. At Montserrat I spent quite a bit of time in prayer, weeping over the things in life that can’t be fixed, leaning into grief in hope of finding some of the peace and acceptance that often lies on the other side of tears. Never one with a strong Marian devotion, I can’t say I sought Mary’s consolation or intercession specifically. I’m not sure I know how. But she was there. When will I learn that my faith does not have to resemble anyone else’s? That just because Ignatius’s desire to defend the honor of Our Lady leaves me cold, that doesn’t mean that either of us is wrong? That just because turning to Mary is not my first inclination, that doesn’t mean I don’t have a Marian devotion? When will I learn that comparing my faith to another’s devalues the specificity with which God created each of us? Throughout our trip we continued to sing the Salve Regina at the celebration of the Eucharist. It feels almost like a betrayal, like sharing a secret, to try to describe how this chant followed us on the journey we made together and on the individual journeys of each of our hearts. Each time we sang it my heart would strain at the cadence when we sing “in hac lacrymarum valle” – in this valley of tears. This is where Mary meets me, the valley of tears that she knew well. She is dear to me for this reason, because she knew suffering, because she was human, because she made choices, because her soul proclaimed the greatness of the Lord. This is where I meet her, and that is enough.